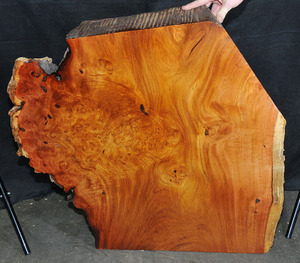 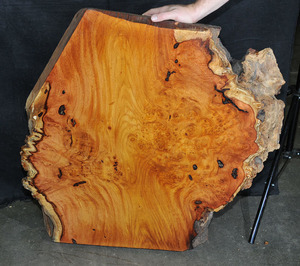 This slice of burl came from an ancient forest tree of Laos. Surviving its youth as a sapling, it survived despite tropical monsoons, insect invasions, and wars to become a behemoth 16 feet in girth and 50 feet to its first branch. It eventually succumbed to old age and began the inevitable journey back to the earth from whence it came. This burl was rescued before its total demise but not before some insects left some damage in the outer sapwood. 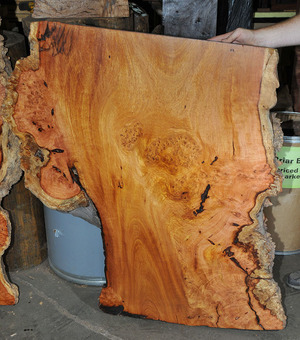 A unique, one-of-a-kind forest gem. 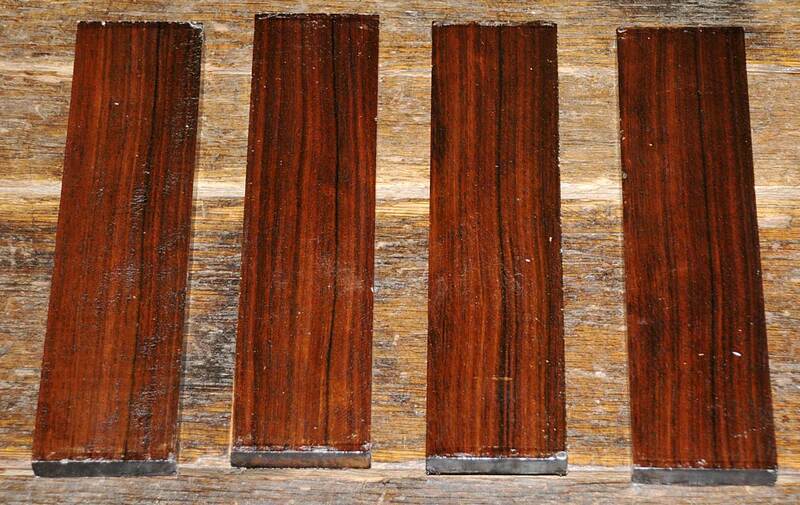 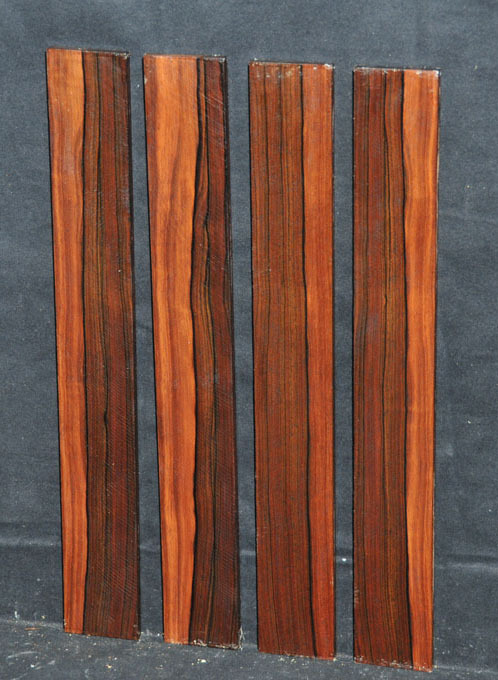 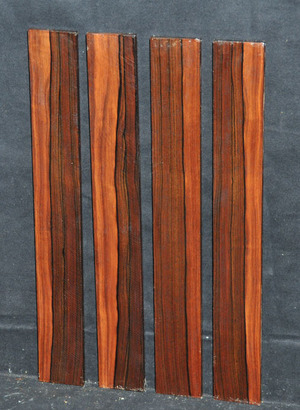 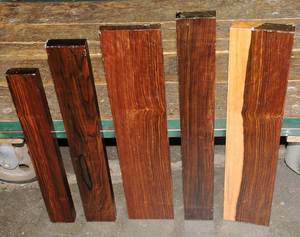 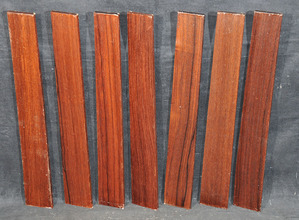 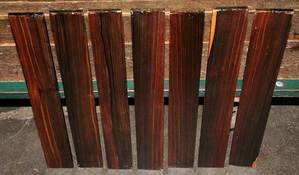 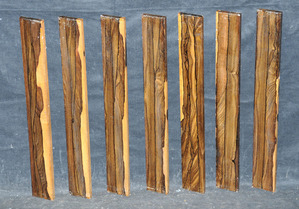 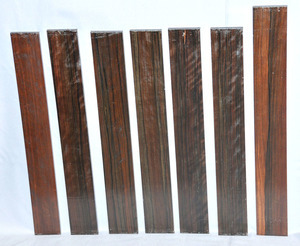 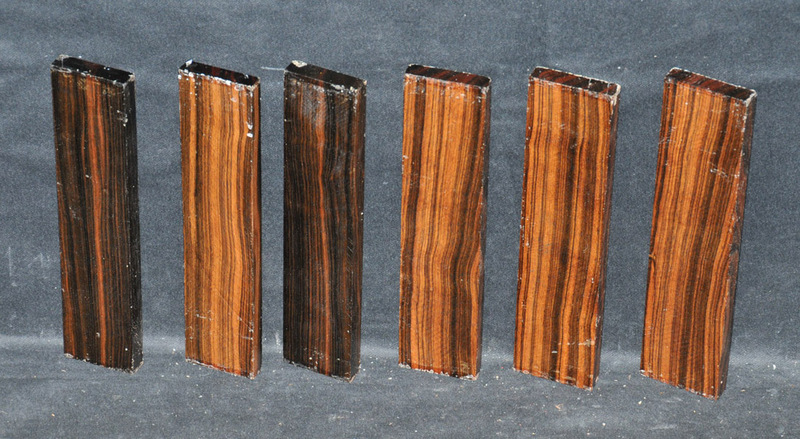 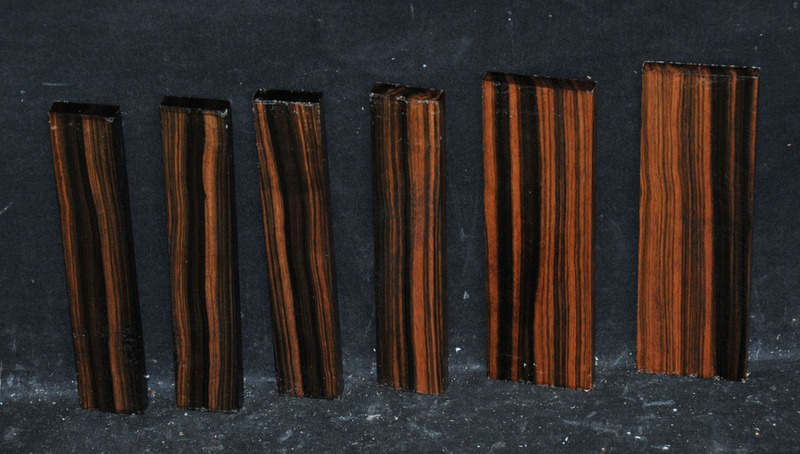 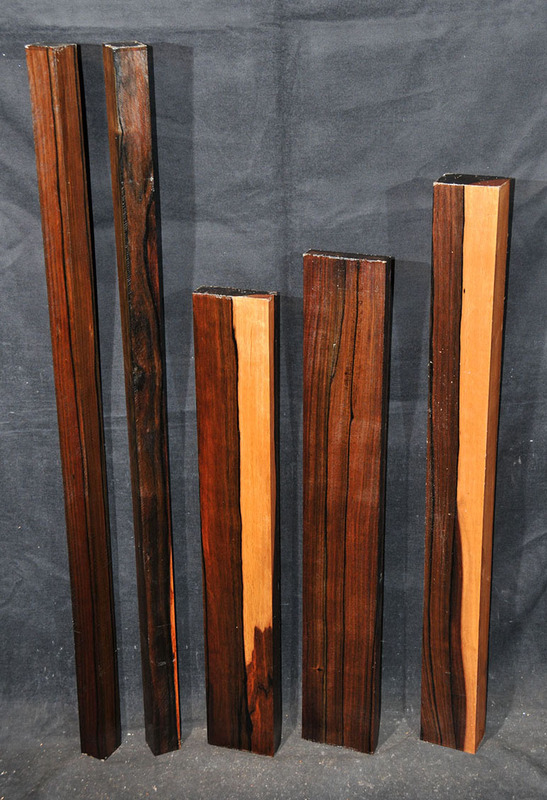 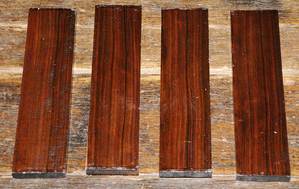 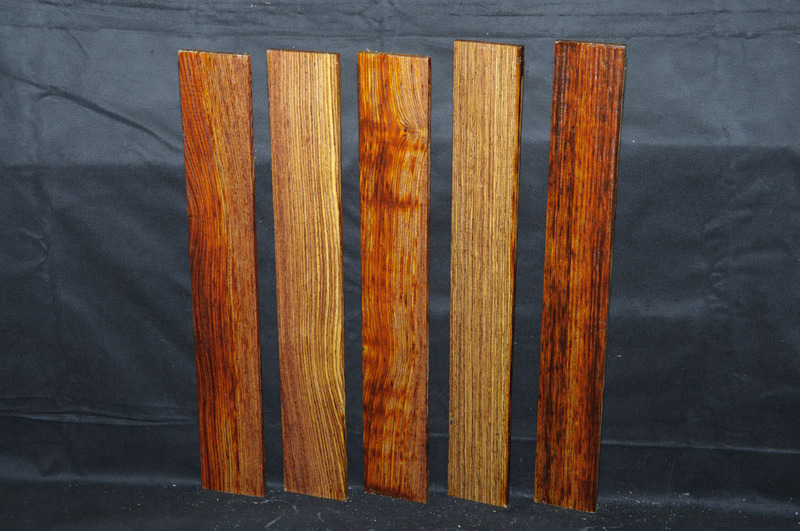 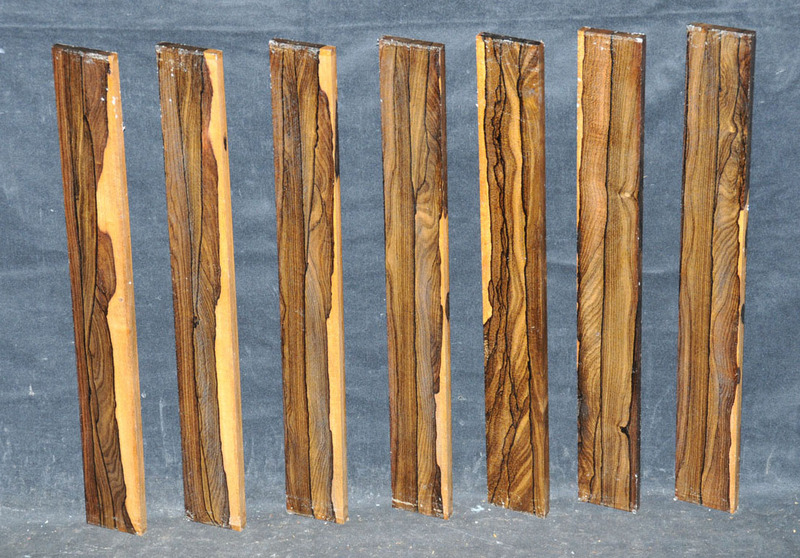 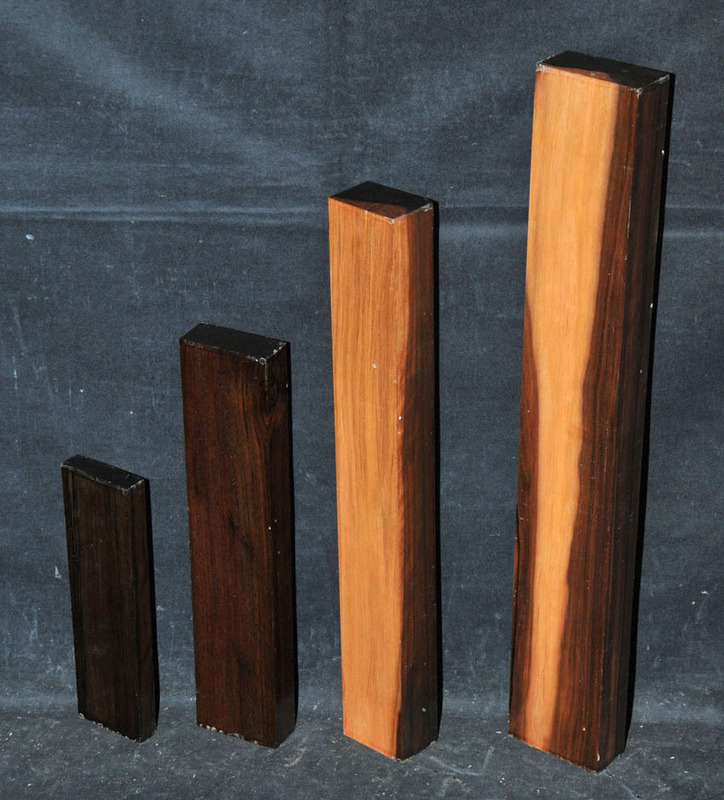 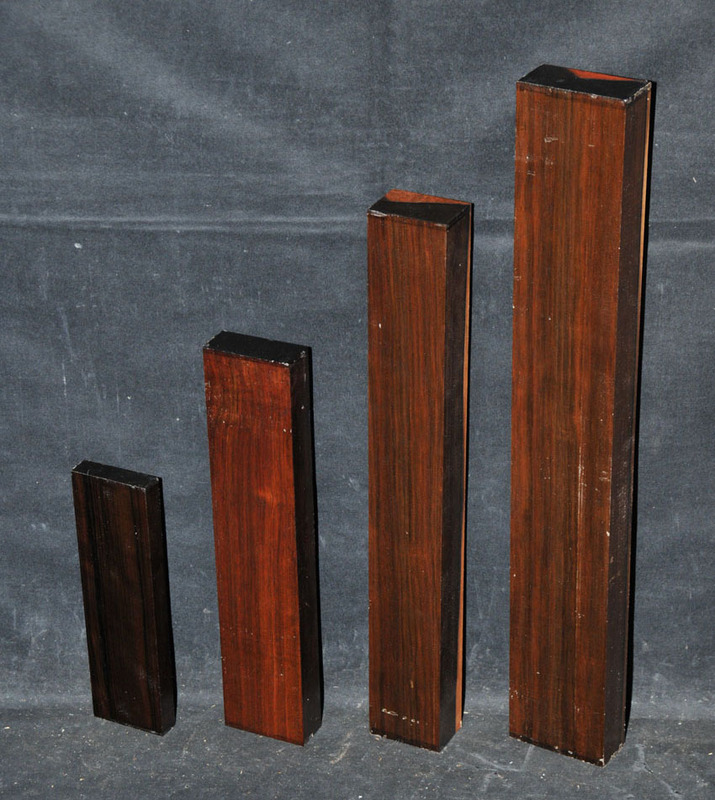 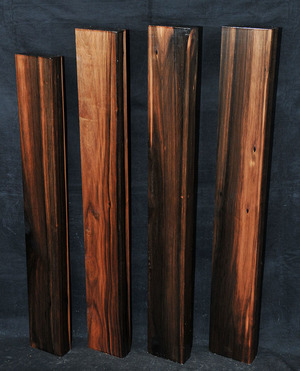 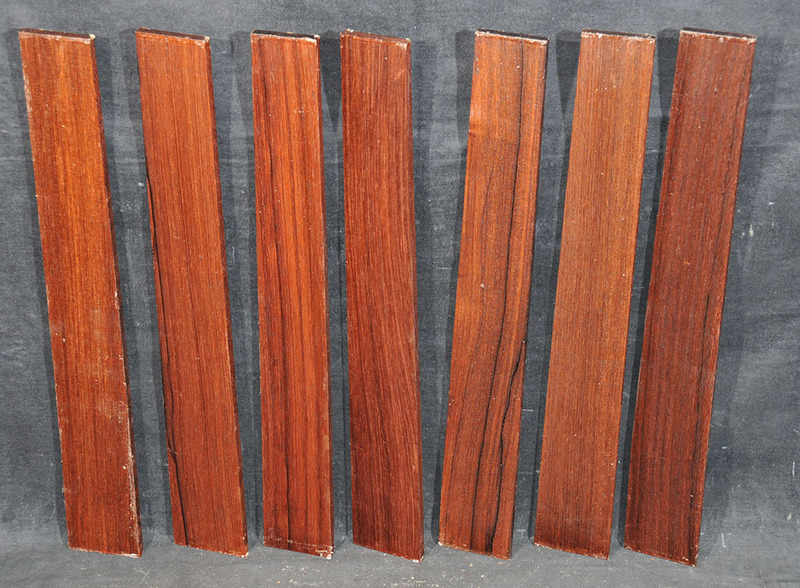 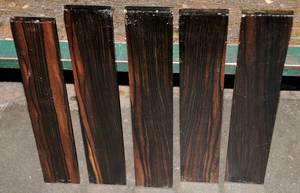 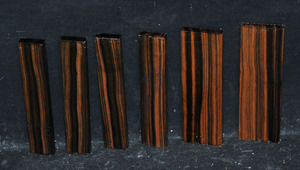 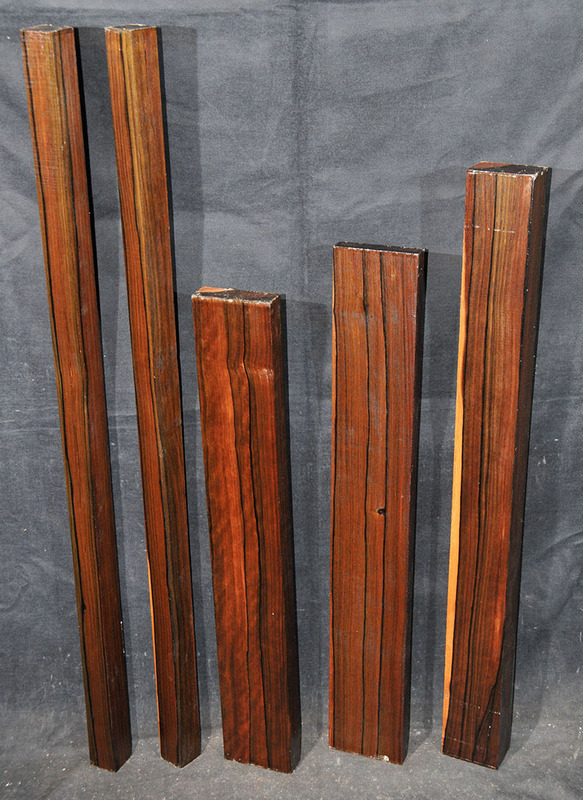 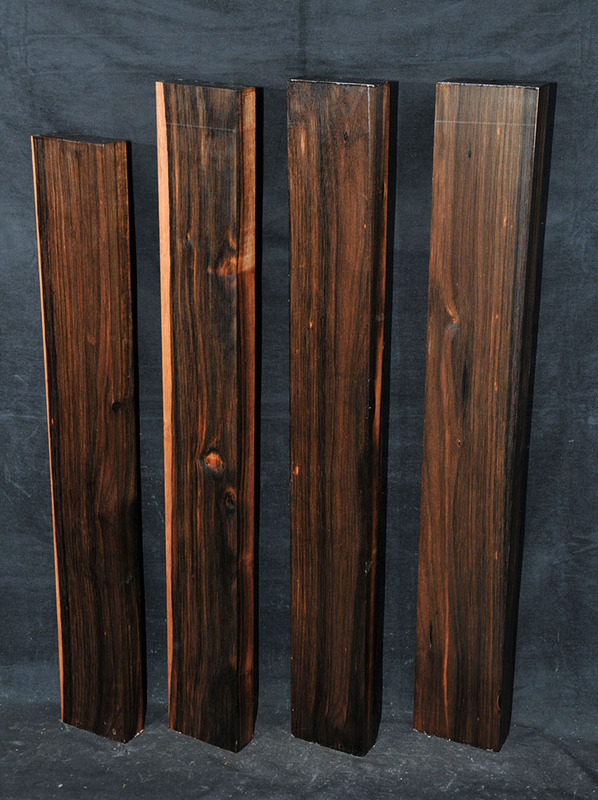 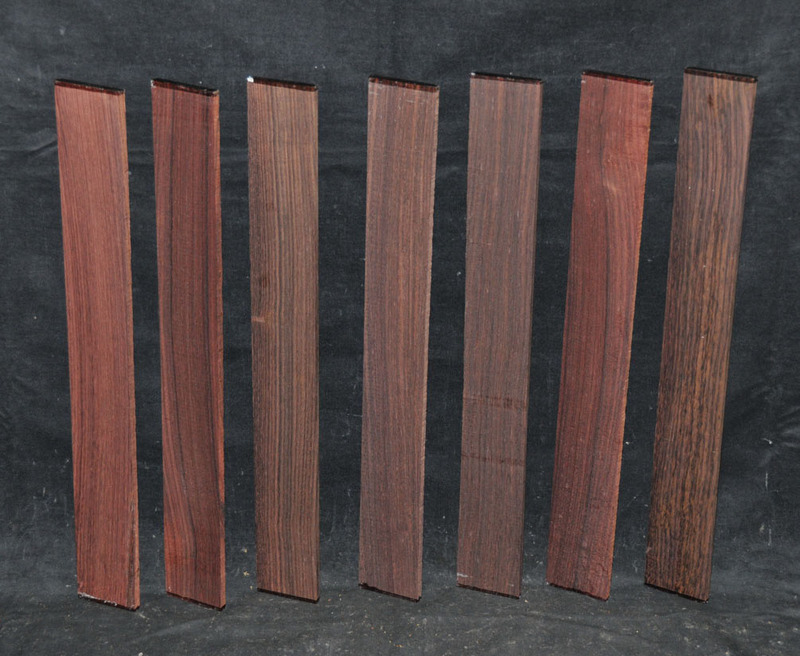 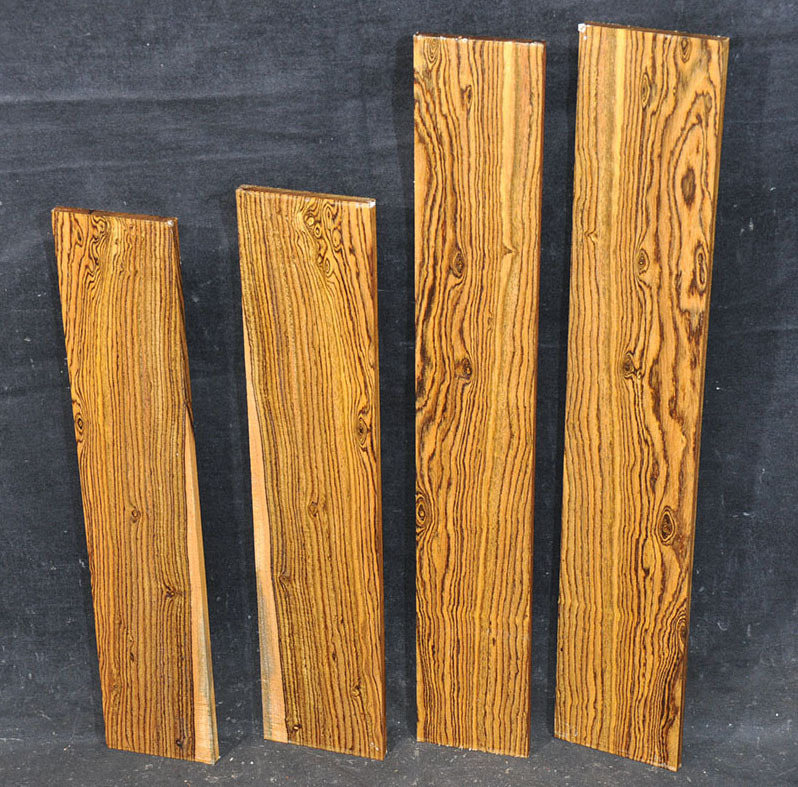 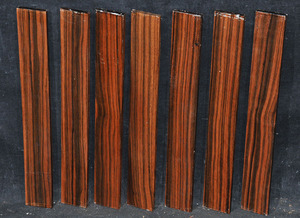 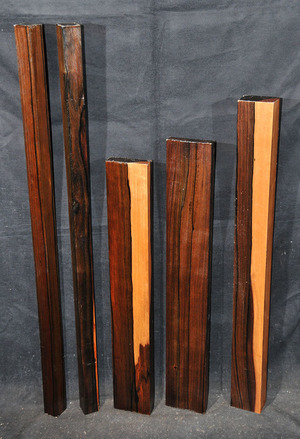 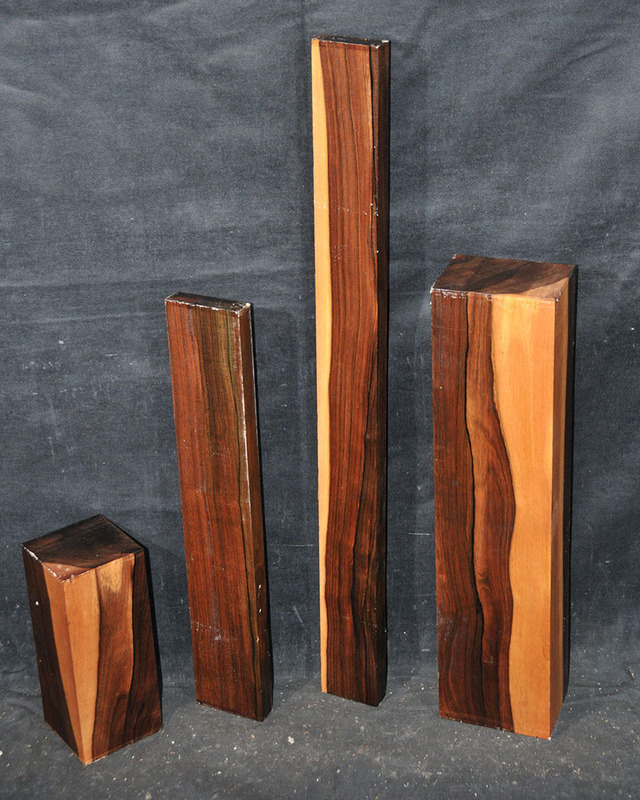 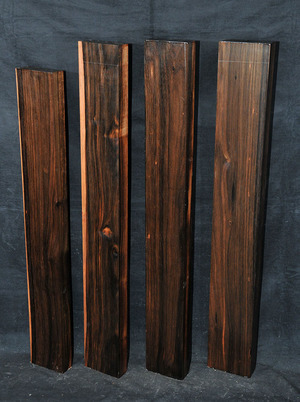 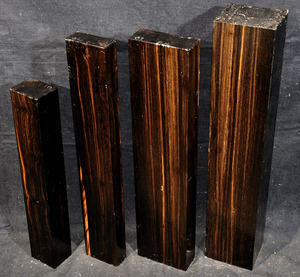 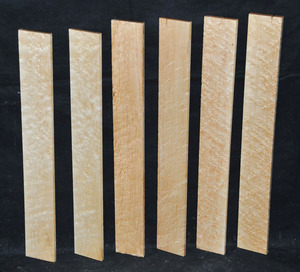 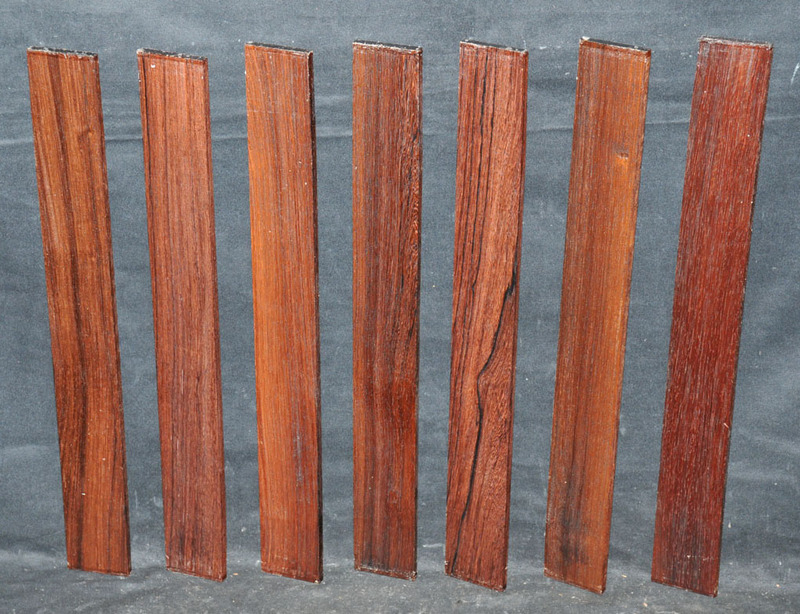 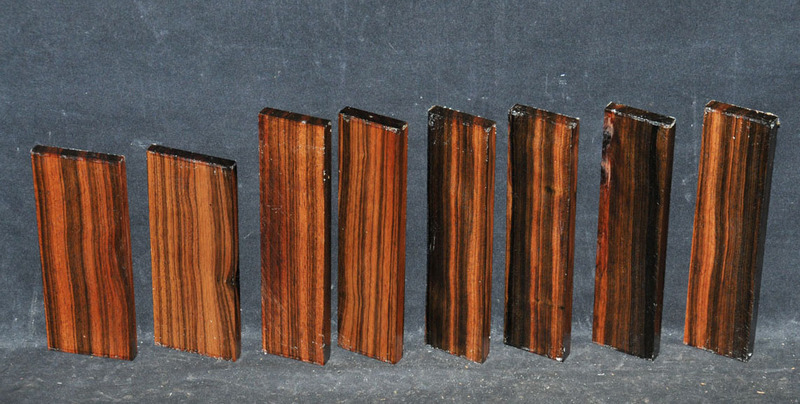 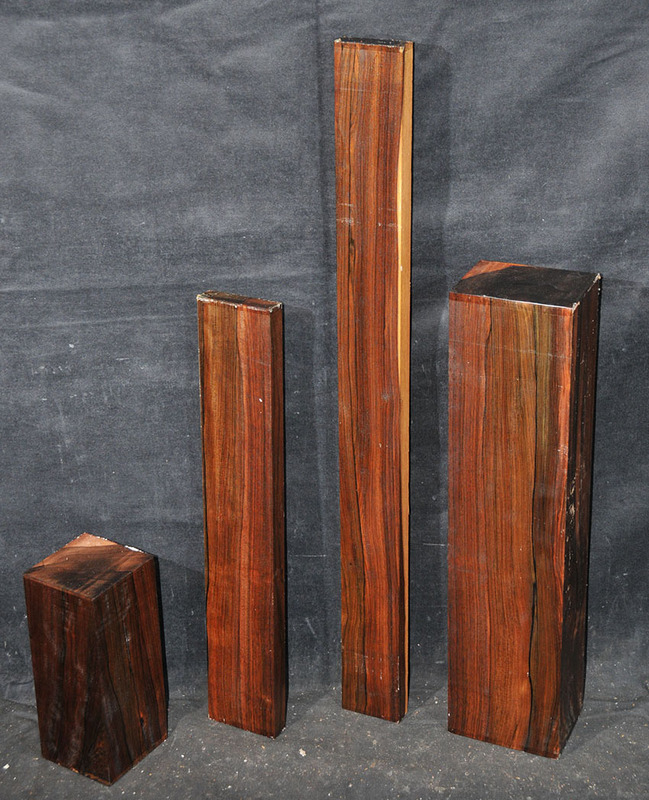 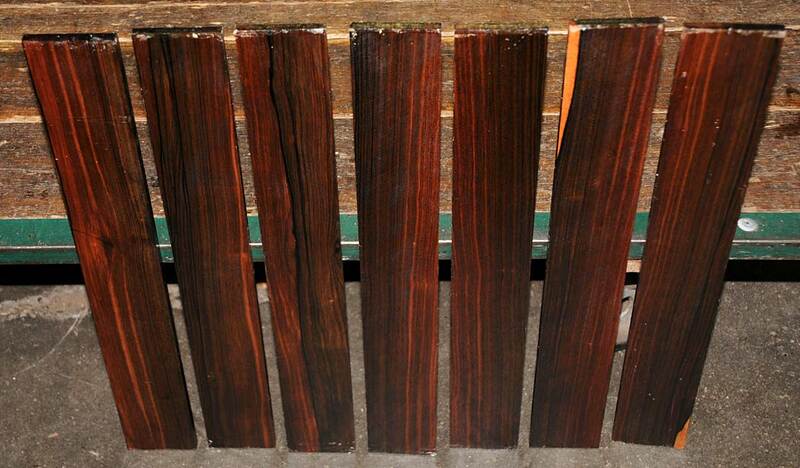 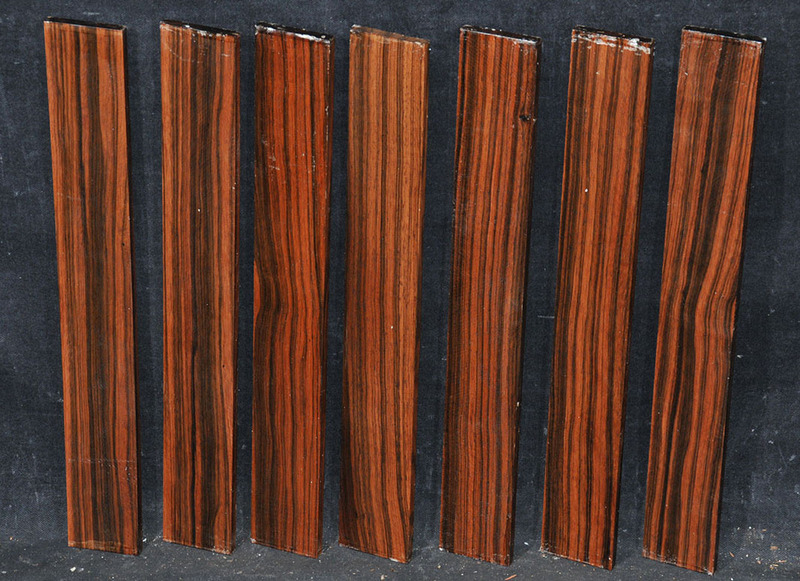 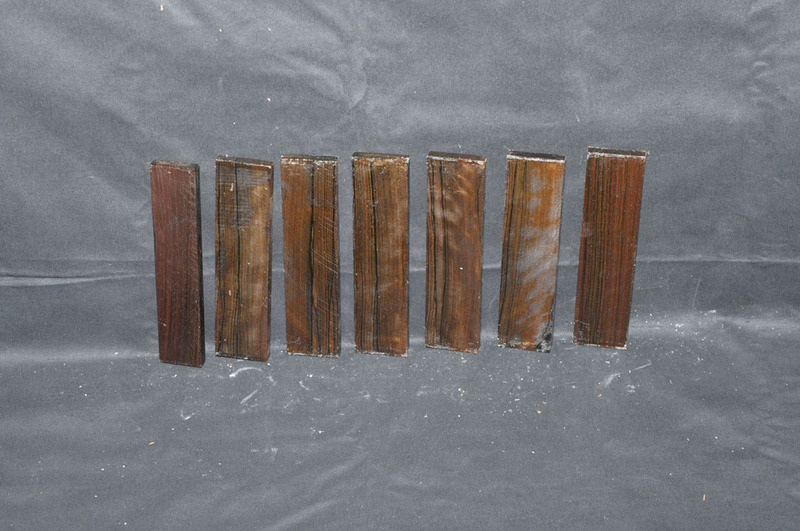 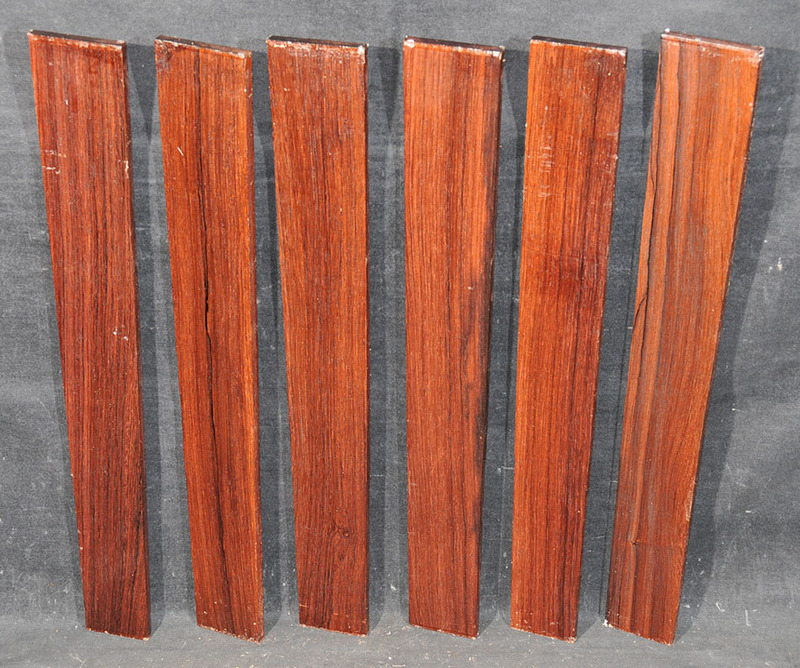 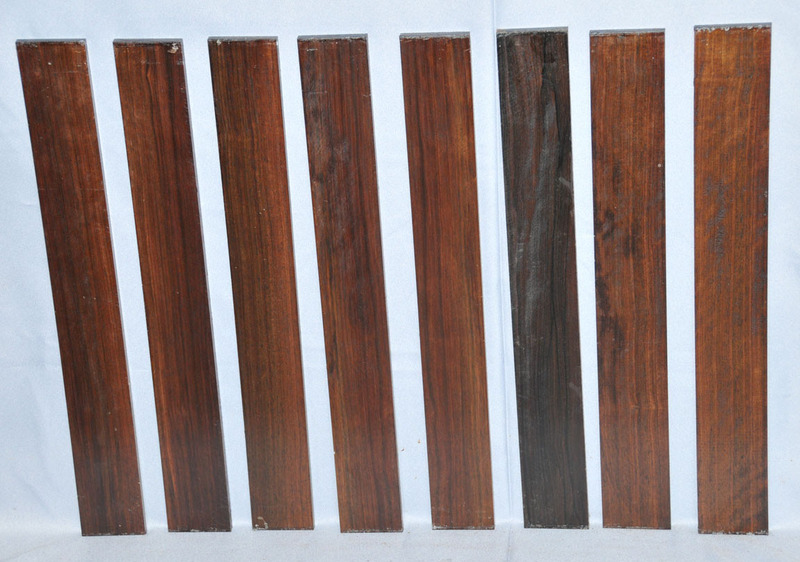 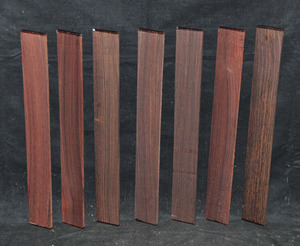 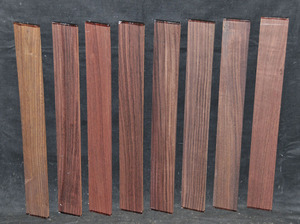 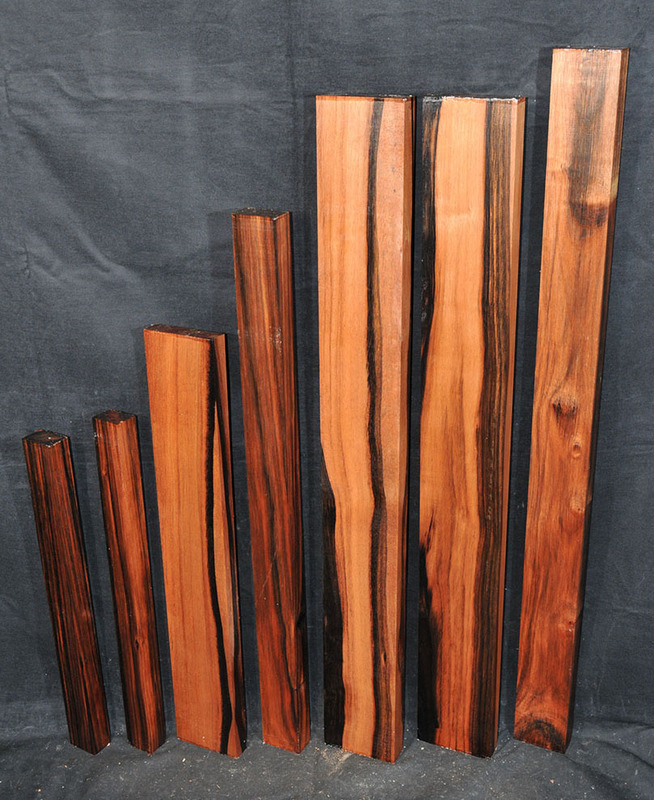 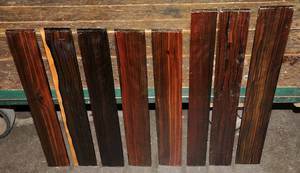 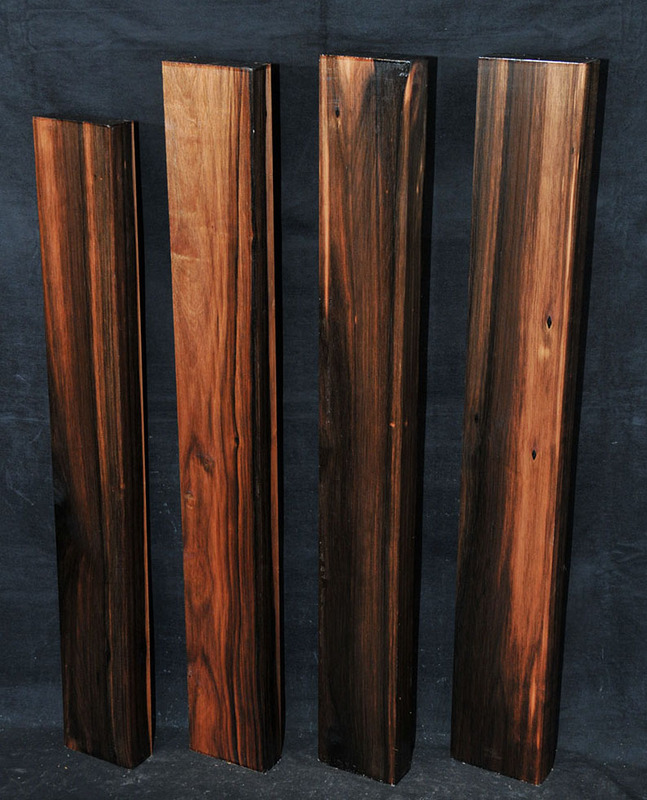 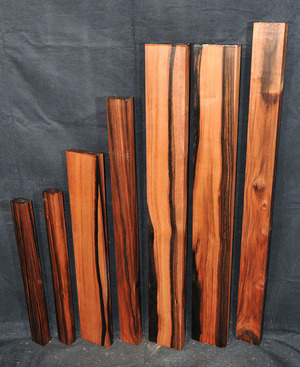 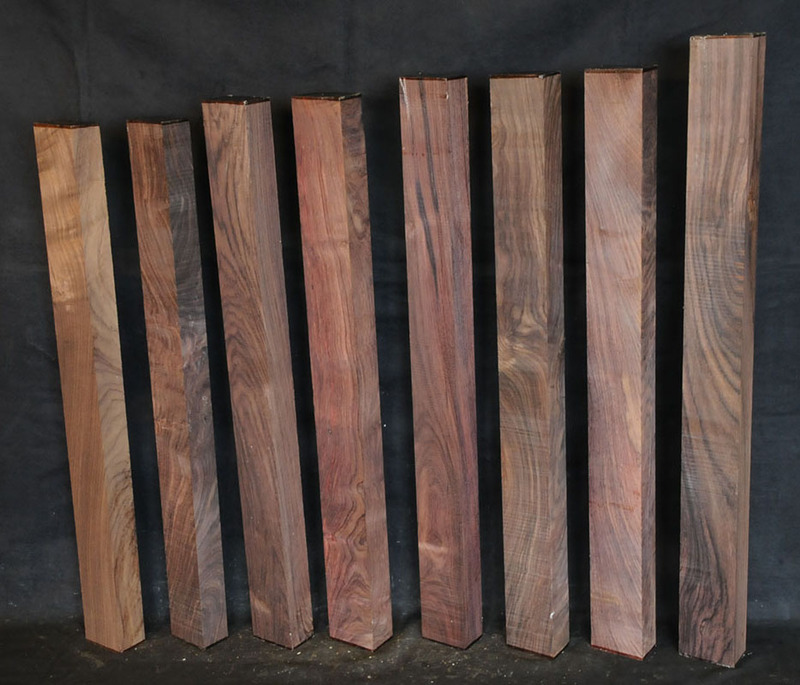 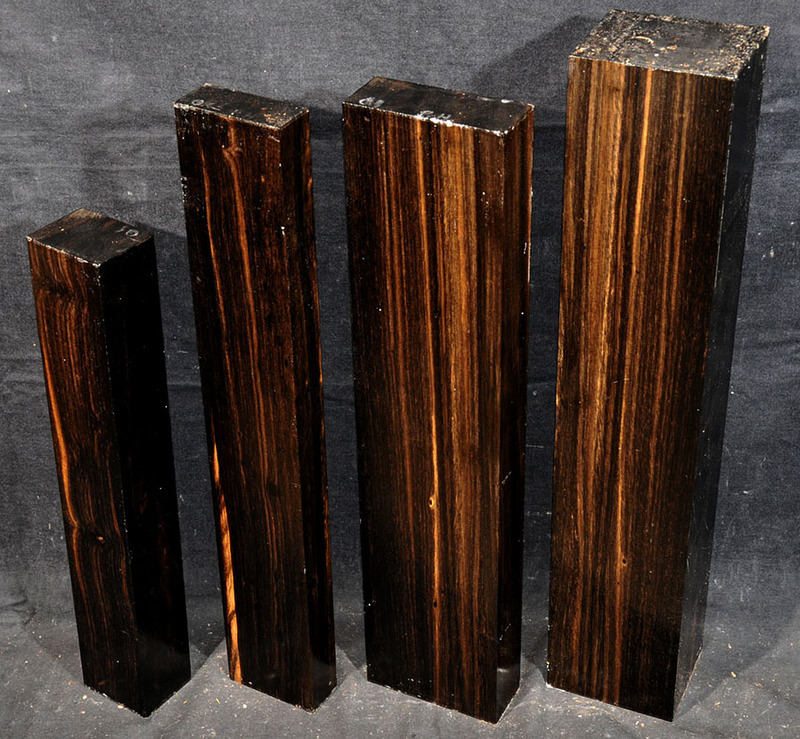 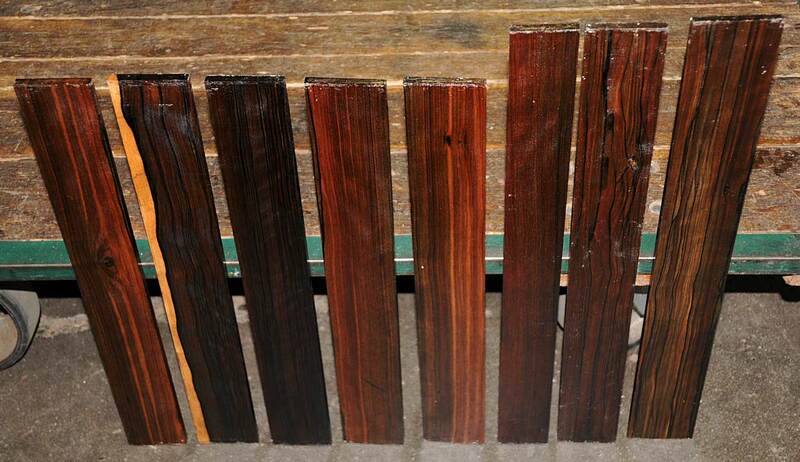 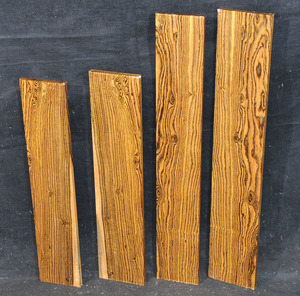 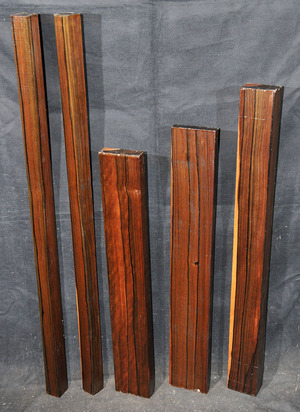 3 3/4 x up to 35 x 35"
3 1/2 x up to 42 x 45 3/8"
Bocote is an oily wood with a yellowish to dark brown color accented with irregular black stripes and streaks. 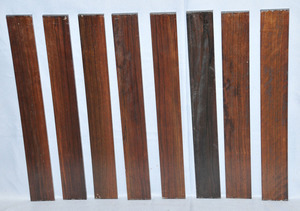 It has a spicy smell and is hard, heavy and strong. 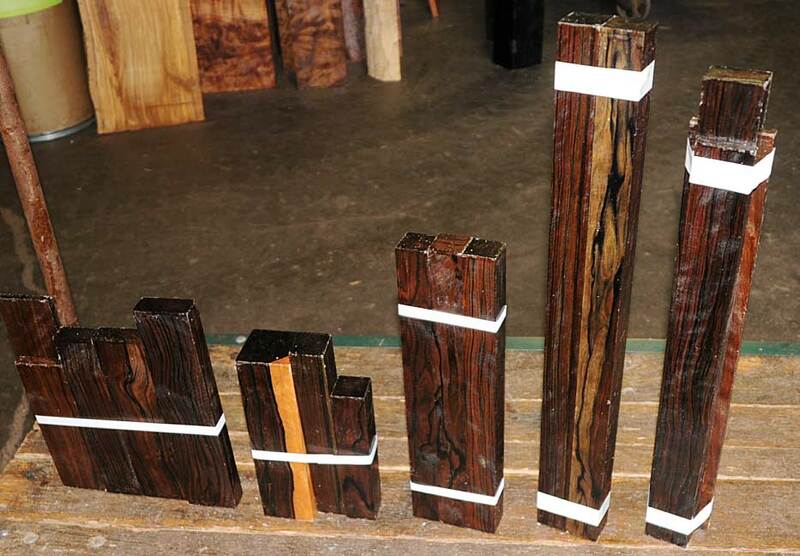 It is easy to work and takes a very nice polish. 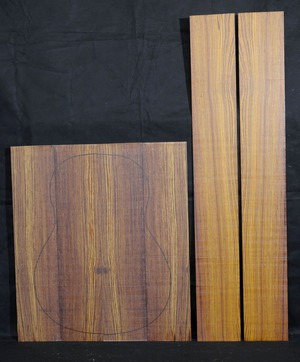 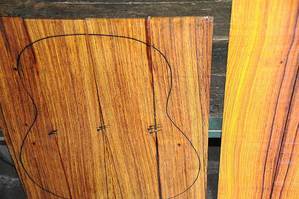 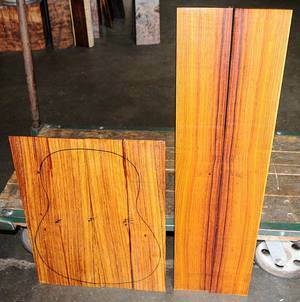 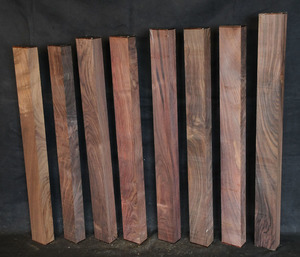 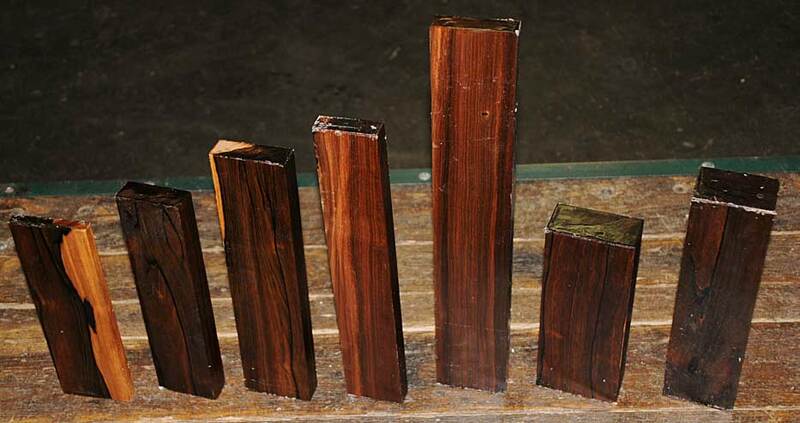 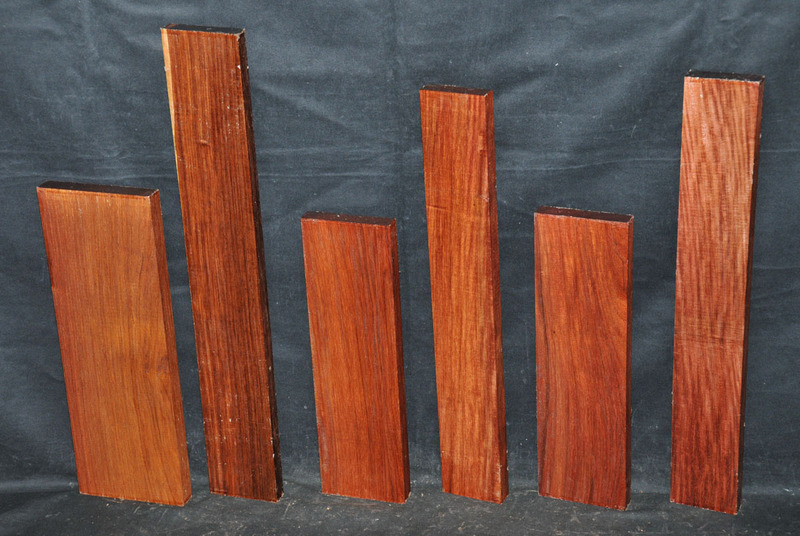 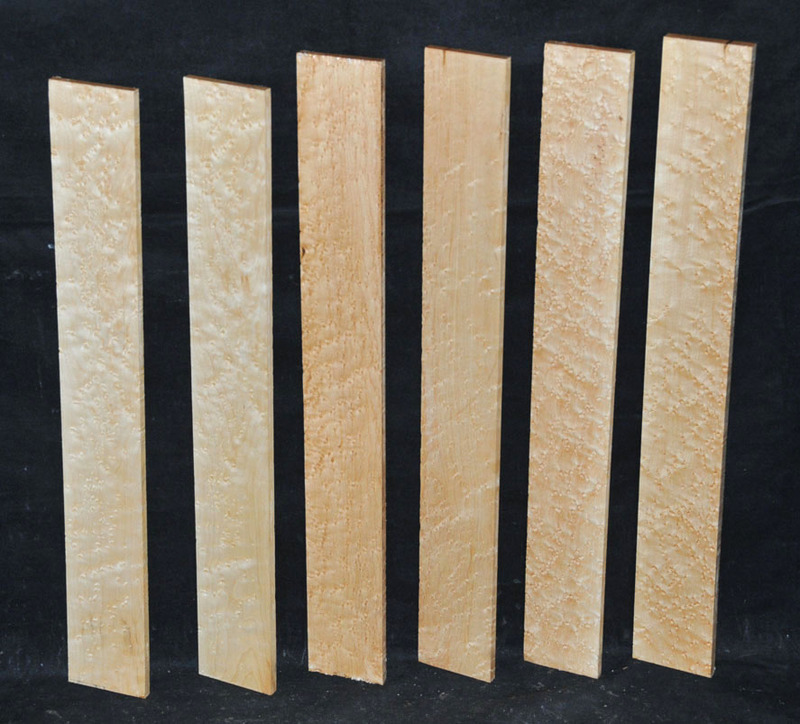 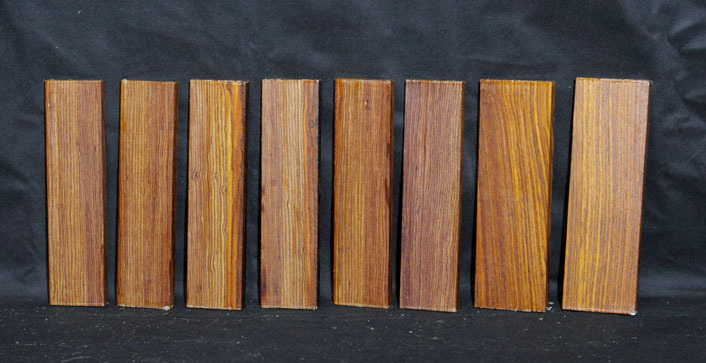 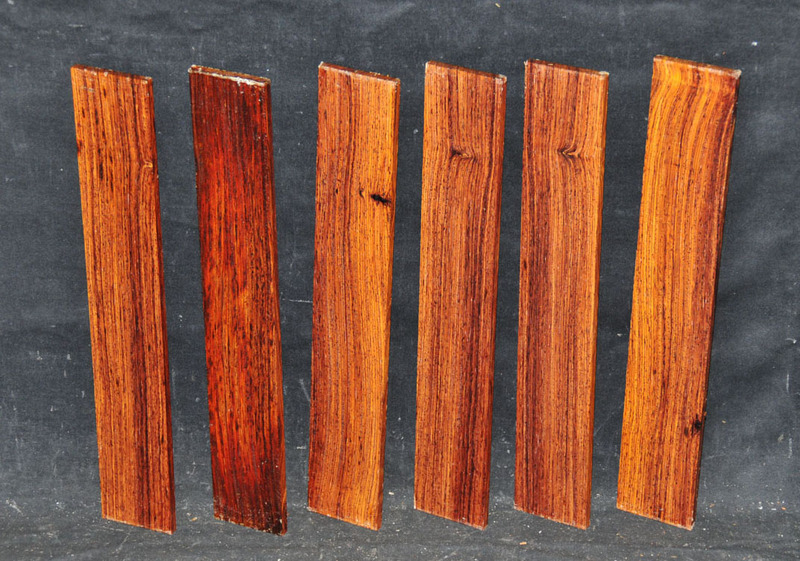 This beautiful wood is seldom seen in woodworker's shops. 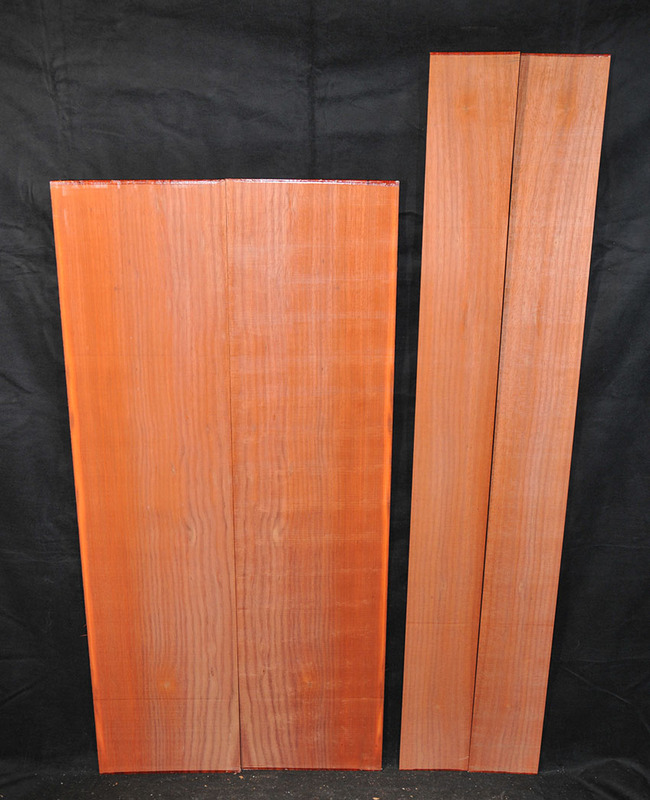 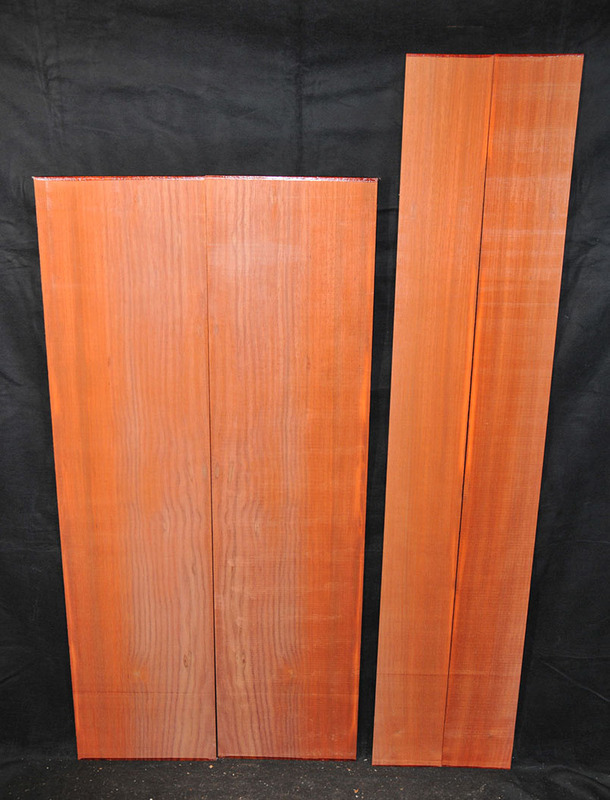 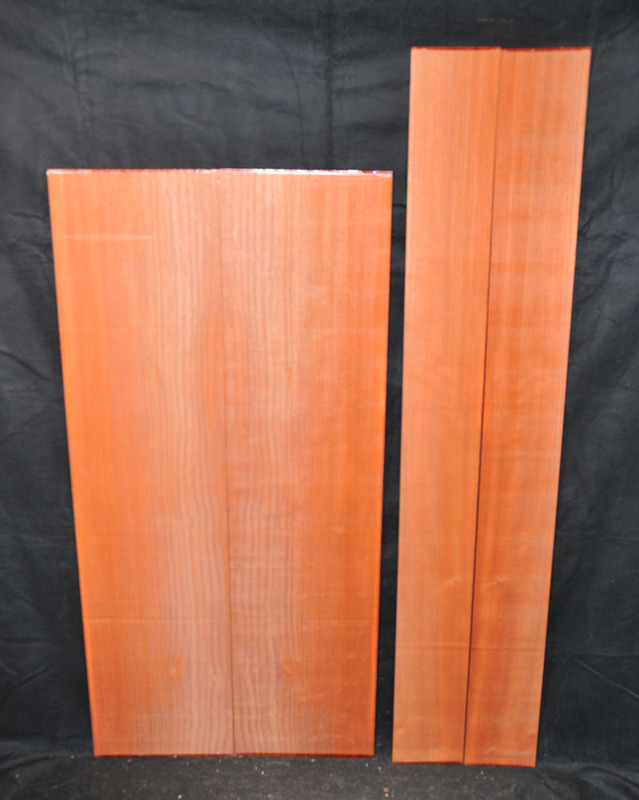 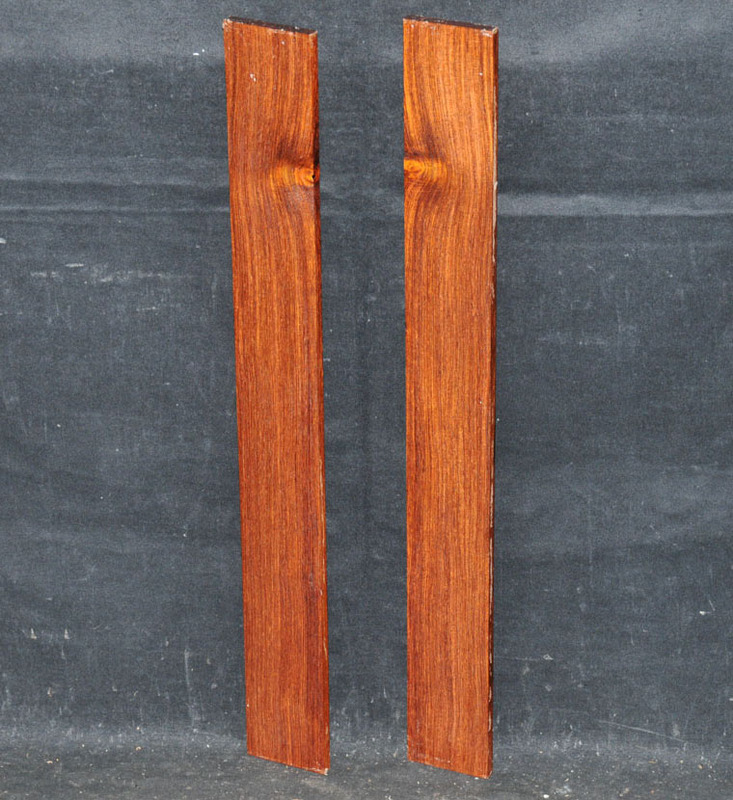 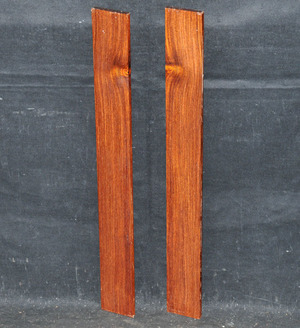 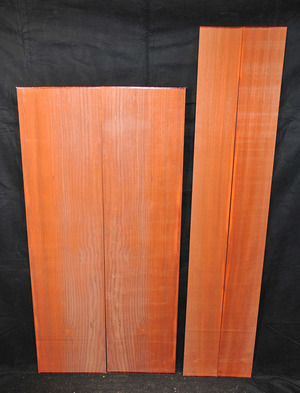 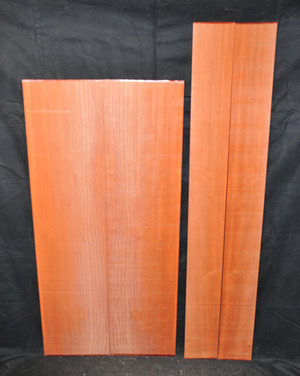 Backs 3/16 x 8 3/16 x 23 1/8"
Sides 3/16 x 5 x 36 3/4"
May have a few minor defects and has been priced accordingly. 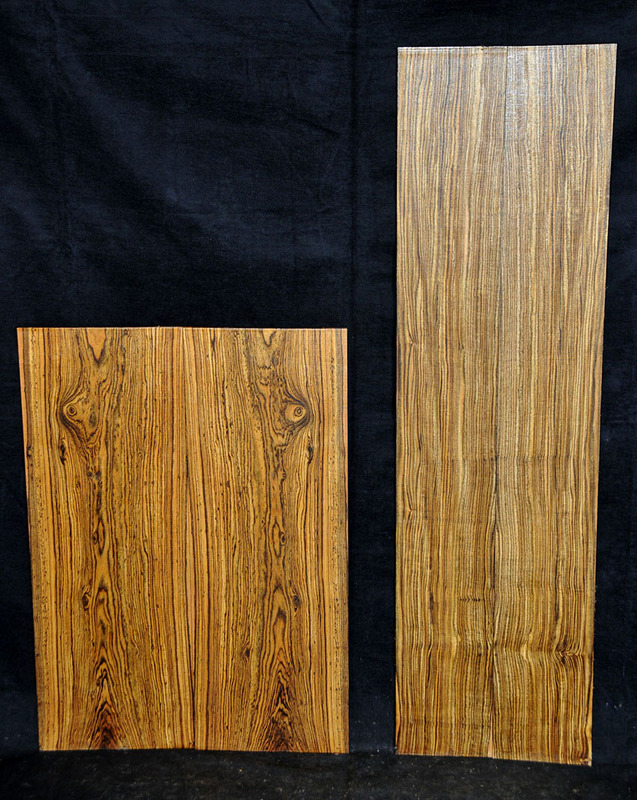 A 1 11/16 x 2 3/4 x 27 7/8"
B 1 11/16 x 2 5/8 x 27 7/8"
C 1 3/4 x 2 3/4 x 28 3/4"
D 1 13/16 x 2 13/16 x 28 7/8"
E 1 3/4 x 2 11/16 x 29 1/2"
F 1 3/4 x 2 11/16 x 29 1/2"
G 1 3/4 x 2 3/4 x 29 5/8"
H 1 13/16 x 2 13/16 x 30 13/16"
This Indonesian Ebony is also known as Kayu Malam. 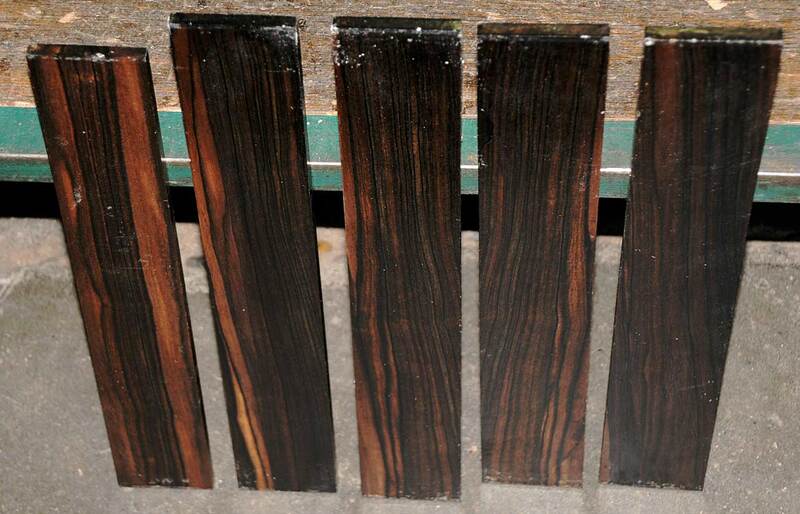 It usually has nice striping on the radial face and is easy to work and sand and takes a very nice finish. 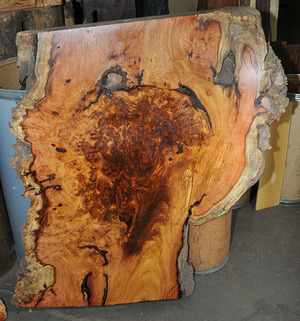 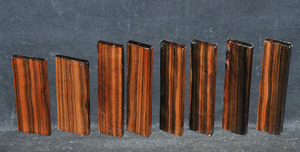 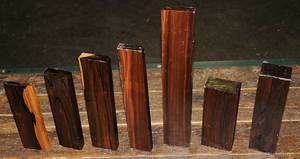 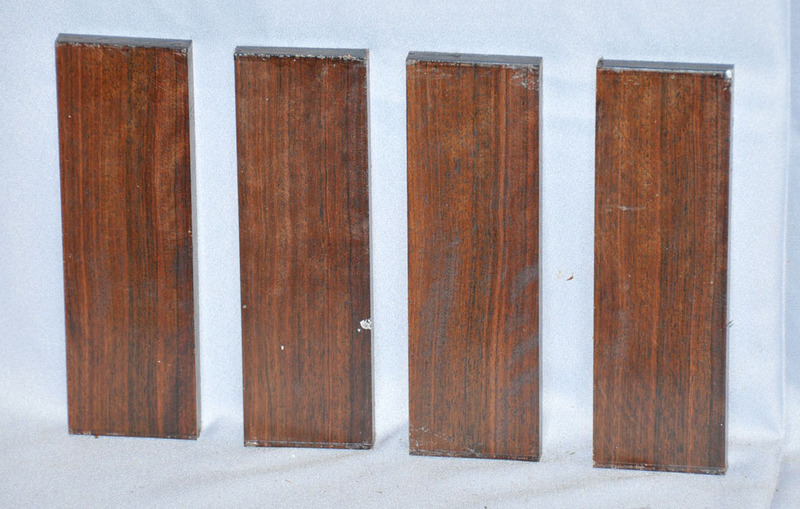 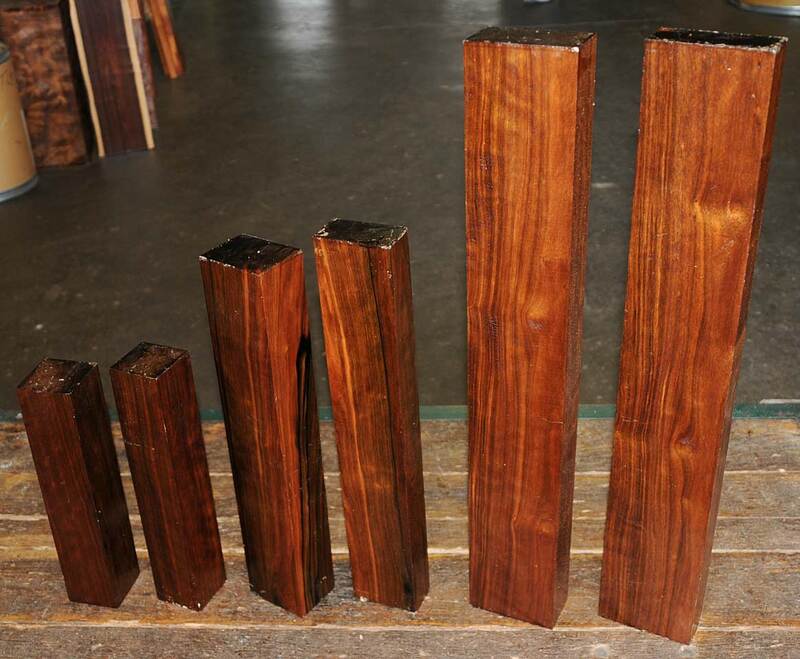 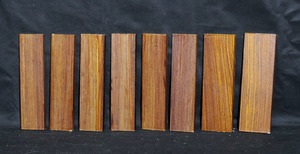 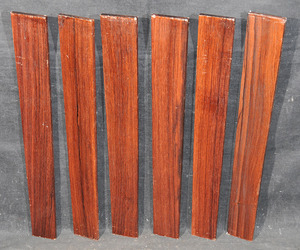 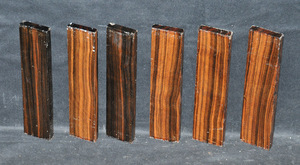 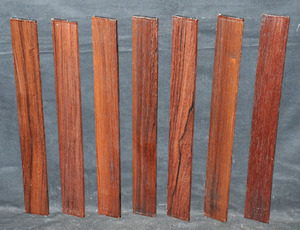 Used for cabinetry, furniture, turned objects, jewelry cases, knife handles, and other precious items. 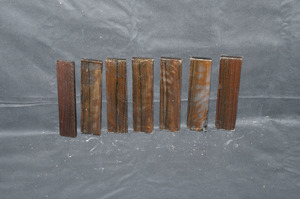 Air-dried. 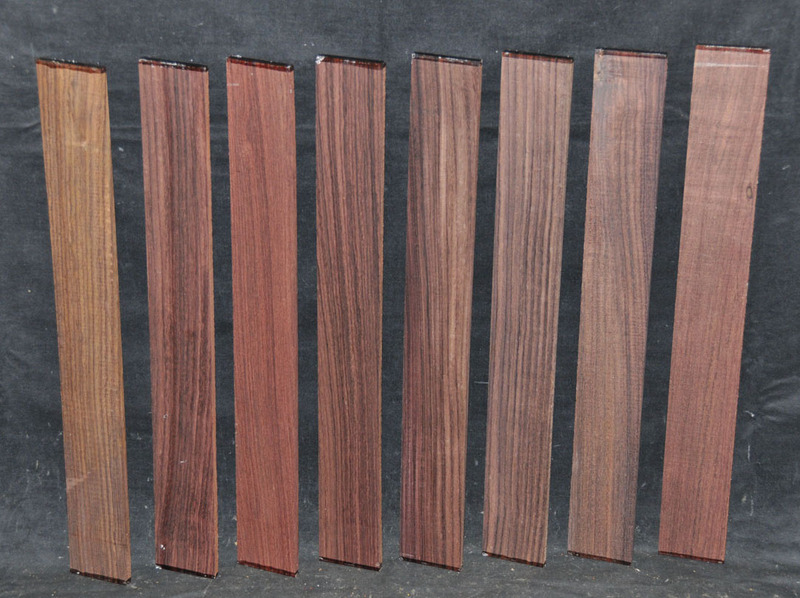 A 1 3/4 x 4 1/2 x 33 1/4"
B 1 5/8 x 4 11/16 x 36 1/8"
C 1 3/4 x 4 1/2 x 36 1/8"
D 1 3/4 x 5 x 36 1/4"
A 2 5/16 x 2 7/8 x 17 3/4"
B 1 1/2 x 3 1/2 x 22"
C 2 x 5 x 22"
D 3 3/4 x 4 1/2 x 23 3/8"
A 3/8 x 2 3/16-2 3/4 x 20 5/8"
B 3/8 x 2 3/16-2 3/4 x 20 5/8"
C 3/8 x 2 3/16-2 3/4 x 20 5/8"
D 3/8 x 2 3/16-2 3/4 x 20 5/8"
E 3/8 x 2 3/16-2 3/4 x 20 5/8"
F 3/8 x 2 3/16-2 3/4 x 20 5/8"
G 3/8 x 2 3/16-2 3/4 x 20 5/8"
A 3/8 x 3 9/16 x 17 7/8"
B 3/8 x 3 7/8 x 18 1/4"
C 3/8 x 3 1/2 x 22 3/8"
D 3/8 x 4 x 22 1/2"
A 1 3/8 x 2 x 19 7/8"
B 1 3/8 x 1 3/4 x 21"
C 1 1/16 x 4 1/8 x 25 3/8"
D 1 3/8 x 2 3/8 x 31 3/8"
E 1 3/8 x 4 3/8 x 36 1/2"
F 1 1/4 x 4 7/16 x 36 1/2"
G 1 5/16 x 3 x 38 7/16"
A 1 1/2 x 1 1/2 x 36 3/16"
B 1 7/16 x 1 7/16 x 36 1/4"
C 1 1/4 x 3 11/16 x 25 1/8"
D 15/16 x 4 x 26 5/8"
E 1 15/16 x 3 x 30 1/8"
This brick-red colored West African hardwood was once one of the more common imported hardwoods but has become increasingly scarce in the last couple of years. 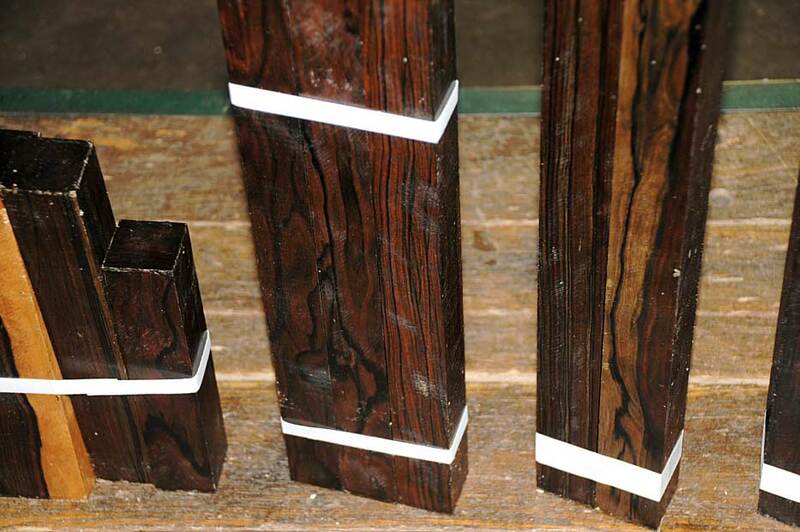 It is easy to work, takes a nice polish and is dimensionally stable. 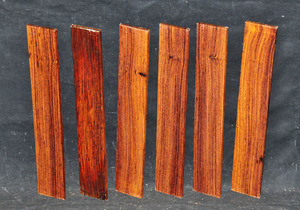 Kiln-dried. 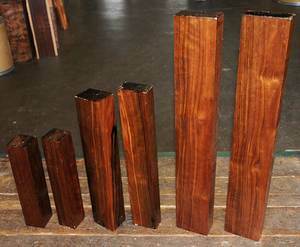 Backs 3/16 x 10 1/4 x 41 1/8"
Sides 3/16 x 5 x 48"
Sides 3/16 x 5 1/16 x 48"
Sides 3/16 x 5 1/8 x 48"
A 3 3/8 x 3 3/8 x 8 1/4"
B 13/16 x 3 x 17 3/4"
C 7/8 x 2 1/2 x 26 11/16"
D 3 1/4 x 4 7/16 x 18 1/2"
This wood originated from a small, sparsely inhabited island off the east coast of New Guinea. 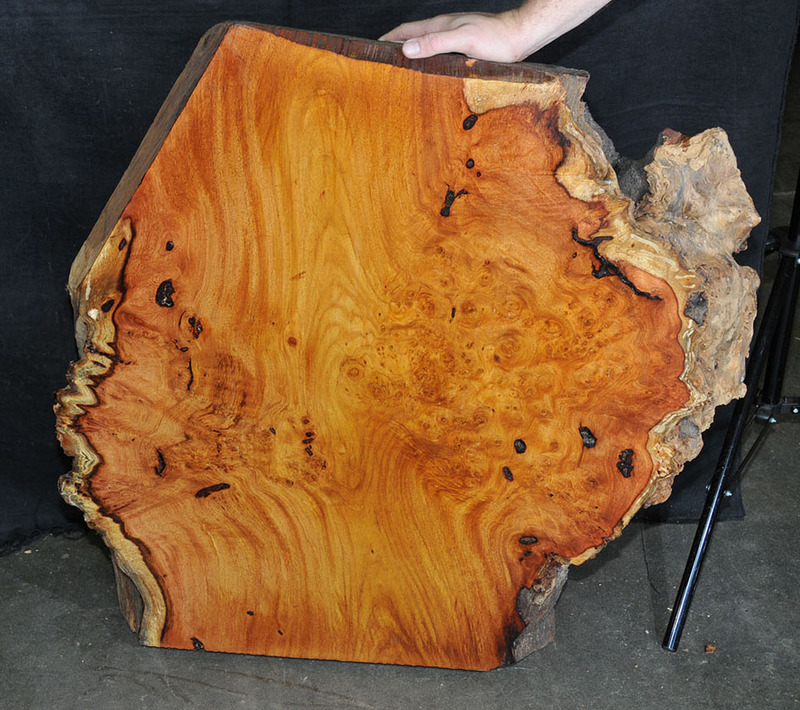 Some of these trees grow to enormous dimensions. 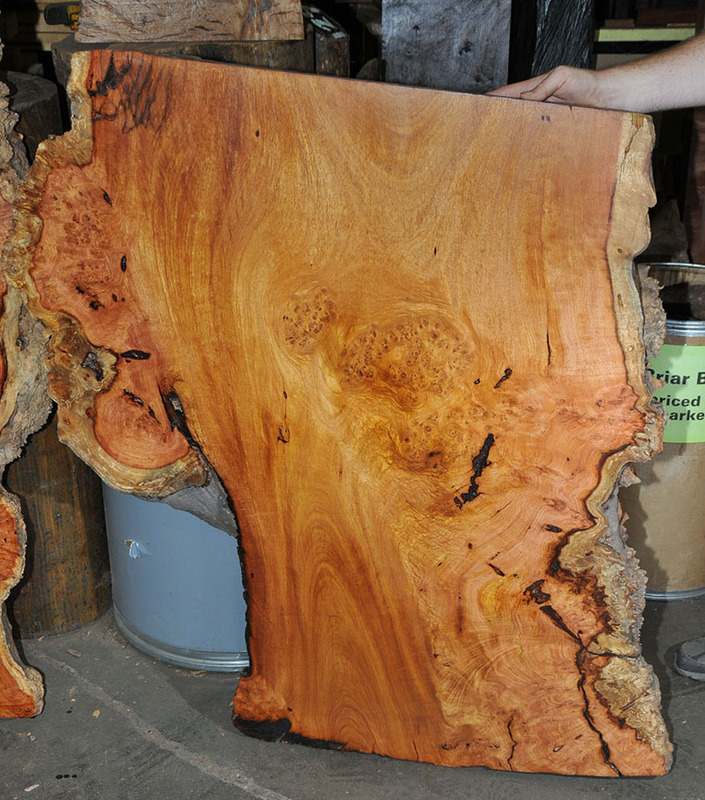 One of the first logs we received from here was 3 1/2 feet in diameter, 18 feet long, and weighed 7 tons. 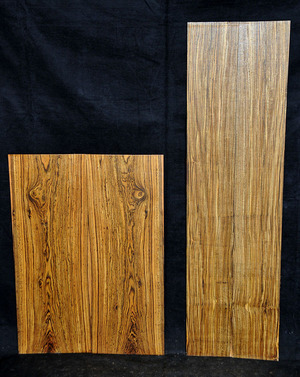 It is fine-grained and takes a glassy smooth finish. 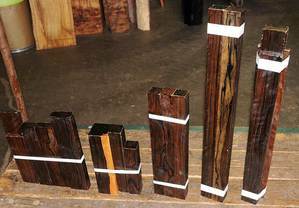 Most of these pieces have a "marble-cake" look to the end grain that is outstanding. 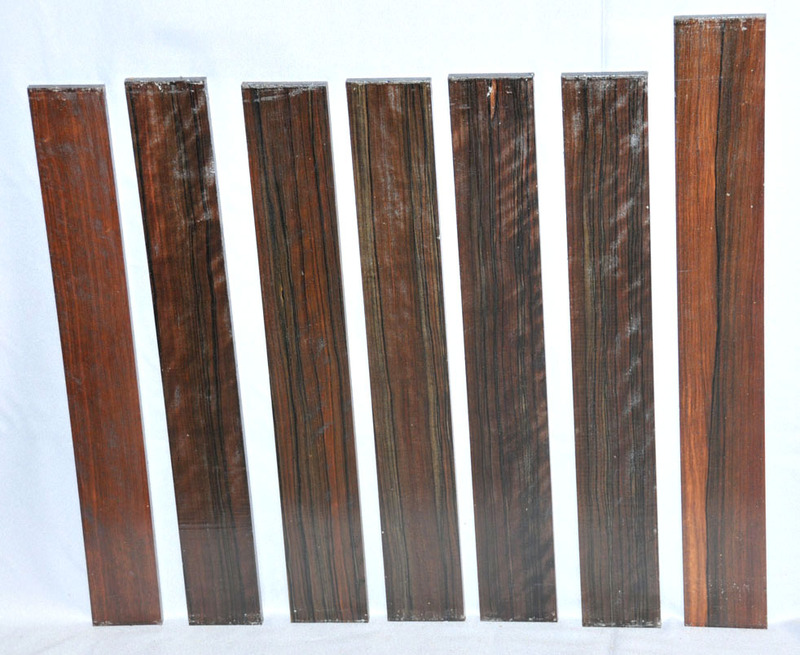 A 5/16-3/8 x 2-2 1/8 x 15 1/8"
B 5/16-3/8 x 2-2 1/8 x 15 1/8"
C 5/16-3/8 x 2-2 1/8 x 15 1/8"
D 5/16-3/8 x 2-2 1/8 x 15 1/8"
E 5/16-3/8 x 2-2 1/8 x 15 1/8"
F 5/16-3/8 x 2-2 1/8 x 15 1/8"
G 5/16-3/8 x 2-2 1/8 x 15 1/8"
A 5/16 x 2 1/2 x 20 1/8"
B 5/16 x 2 1/2 x 20 1/8"
C 5/16 x 2 1/2 x 20 1/8"
D 5/16 x 2 1/2 x 20 1/8"
E 5/16 x 2 1/2 x 20 1/8"
F 5/16 x 2 1/2 x 20 1/8"
G 5/16 x 2 1/2 x 20 1/8"
H 5/16 x 2 1/2 x 20 1/8"
A 5/16-3/8 x 2 1/2-2 9/16 x 15 1/4"
B 5/16-3/8 x 2 1/2-2 9/16 x 15 1/4"
C 5/16-3/8 x 2 1/2-2 9/16 x 15 1/4"
D 5/16-3/8 x 2 1/2-2 9/16 x 15 1/4"
E 5/16-3/8 x 2 1/2-2 9/16 x 15 1/4"
F 5/16-3/8 x 2 1/2-2 9/16 x 15 1/4"
A 5/16-3/8 x 2 3/4 x 20 3/16"
B 5/16-3/8 x 2 3/4 x 20 3/16"
C 5/16-3/8 x 2 5/8 x 20 3/4"
D 5/16-3/8 x 2 5/8 x 20 3/4"
E 5/16-3/8 x 2 5/8 x 20 3/4"
F 5/16-3/8 x 2 5/8 x 20 3/4"
A 3/8 x 2 3/8 x 21"
B 3/8 x 2 3/8 x 21"
A 3/8 x 2-2 1/8 x 16 1/2"
B 3/8 x 2-2 1/8 x 16 1/2"
C 3/8 x 2-2 1/8 x 16 1/2"
D 3/8 x 2-2 1/8 x 16 1/2"
E 3/8 x 2-2 1/8 x 16 1/2"
F 3/8 x 2-2 1/8 x 16 1/2"
G 3/8 x 2-2 1/8 x 16 1/2"
A Back 1 x 5 7/8 x 17"
Side 7/8 x 3 3/4 x 24 7/8"
B Back 1 x 4 1/2 x 15 1/2"
Side 15/16 x 3 1/4 x 21 13/16"
C Back 15/16 x 4 1/2 x 15 5/8"
Side 1 x 3 1/4 x 22 1/8"
A 3/4 x 2 1/8 x 9 1/4"
B 1 1/4 x 2 7/8 x 13 3/4"
C 1 11/16 x 2 1/2 x 18 1/4"
D 1 1/2 x 3 3/8 x 22 1/8"
A 3/8 x 2 5/8 x 6 3/4"
B 3/8 x 2 5/8 x 6 3/4"
C 7/16-1/2 x 2 x 8"
D 7/16-1/2 x 2 x 8"
E 7/16-1/2 x 2 x 8"
F 7/16-1/2 x 2 x 8"
G 7/16-1/2 x 2 x 8"
H 7/16-1/2 x 2 x 8"
A 5/16-3/8 x 2 5/16-2 3/8 x 20-20 3/8"
B 5/16-3/8 x 2 5/16-2 3/8 x 20-20 3/8"
C 5/16-3/8 x 2 5/16-2 3/8 x 20-20 3/8"
D 5/16-3/8 x 2 5/16-2 3/8 x 20-20 3/8"
E 5/16-3/8 x 2 5/16-2 3/8 x 20-20 3/8"
F 5/16-3/8 x 2 5/16-2 3/8 x 20-20 3/8"
G 5/16-3/8 x 2 5/16-2 3/8 x 20-20 3/8"
A 1/2 x 1 1/2 x 8"
B 1/2 x 1 1/2 x 8"
C 1/2 x 1 1/2 x 8"
D 1/2 x 1 5/8 x 8"
E 7/16-1/2 x 2 1/2 x 8"
F 7/16-1/2 x 2 1/2 x 8"
A 7/16-1/2 x 1 3/4 x 8"
B 7/16-1/2 x 1 3/4 x 8"
C 7/16-1/2 x 1 3/4 x 8"
D 7/16-1/2 x 1 7/8 x 8"
E 7/16-1/2 x 1 7/8 x 8"
F 7/16-1/2 x 1 7/8 x 8"
A 7/16 x 2 1/2 x 8"
B 7/16 x 2 1/2 x 8"
C 7/16 x 2 1/2 x 8"
D 7/16 x 2 1/2 x 8"
A 5/16-3/8 x 2 7/16 x 20"
B 5/16-3/8 x 2 9/16 x 20 1/4"
C 5/16-3/8 x 2 3/4 x 20 1/8"
D 5/16-3/8 x 2 11/16 x 20 3/16"
E 5/16-3/8 x 2 3/4 x 20 5/16"
F 5/16-3/8 x 2 3/4 x 20 1/4"
G 5/16-3/8 x 2 13/16 x 22 1/8"
A 5/16-3/8 x 2 7/16 x 20 1/8"
B 5/16-3/8 x 2 7/16 x 20 1/8"
C 5/16-3/8 x 2 7/16 x 20 1/8"
D 5/16-3/8 x 2 7/16 x 20 1/8"
E 5/16-3/8 x 2 7/16 x 20 1/8"
F 5/16-3/8 x 2 1/2 x 20 1/4"
G 5/16-3/8 x 2 9/16 x 20"
H 5/16-3/8 x 2 9/16 x 20"
A 7/16-1/2 x 2 x 8"
B 7/16-1/2 x 2 x 8"
A 3/32 x 3 3/4 x 8"
B 1/8 x 4 x 8"
C 1/8 x 4 x 8"
D 3/32 x 3 3/4 x 8"
E 1/8 x 4 x 8"
F 1/8 x 4 x 8"
G 1/8 x 4 x 8"
H 1/8 x 4 x 8"
A 1/8 x 4 x 8"
D 1/8 x 4 x 8"
A 3/8 x 2 3/8 x 14 1/2"
B 3/8 x 2 1/2 x 15 3/8"
C 3/8 x 2 1/2 x 15 3/8"
D 3/8 x 2 1/2 x 15 3/8"
E 3/8 x 2 1/2 x 15 3/8"
A 1 x 2 7/16 x 18"
B 1 x 3 x 20 3/4"
C 3/4 x 4 5/8 x 21 13/16"
D 1 x 2 7/8 x 23"
E 1 x 4 1/2 x 22 1/8"
A 3/8 x 2 3/8 x 18 3/16"
B 3/8 x 2 3/8 x 18 3/16"
C 3/8 x 2 3/8 x 18 3/16"
D 3/8 x 2 3/8 x 18 3/16"
A each piece 3/8-1 x 2-2 5/8 x 8 1/8-11 3/4"
B each piece 1 1/2-2 1 x 1 1/2-2 1/2 x 7 3/4-10 1/4"
C each piece 1 3/8 x 1 3/8 x 15"
D each piece 1 1/2 x 1 1/2 x 23 9/16"
E each piece 3/8-1 x 2-3 x 20 1/8-22 1/4"
A Backs 1/8-3/16 x 5 3/16 x 14 3/8"
Sides 1/8-3/16 x 3 1/8 x 21 1/4"
B Backs 1/8-3/16 x 5 3/16 x 14 3/8"
Sides 1/8-3/16 x 3 1/8 x 21 3/8"
G 5/8 x 2 1/2 x 8"
H 5/8 x 2 1/2 x 8"
Backs 3/16 x 5 1/16 x 22 5/8"
Sides 1/8-3/16 x 4 15/16 x 36 1/2"
A 1/8-3/16 x 4 x 8"
B 1/8-3/16 x 4 x 8"
C 1/8-3/16 x 4 x 8"
D 1/8-3/16 x 3 3/4 x 8"
E 1/8-3/16 x 4 x 8"
Backs 3/16 x 4 5/16 x 22 11/16"
Sides 1/8-3/16 x 4 7/8 x 36 5/16"
A 3/8 x 2 15/16 x 20 1/8"
B 3/8 x 2 15/16 x 20 1/8"
C 3/8 x 2 15/16 x 20 1/8"
D 3/8 x 2 3/4 x 20 5/8"
E 3/8 x 2 3/4 x 20 5/8"
A 7/16-1/2 x 1 5/8 x 8"
A 7/16 x 3 x 9"
B 1 x 2 9/16 x 10"
C 1 x 2 13/16 x 11 3/4"
D 7/8 x 2 3/8 x 13"
E 7/8 x 2 7/8 x 16 3/8"
F 1 3/4 x 3 1/4 x 8"
G 2 x 2 3/4 x 10"